At the age of 19, Ross travelled to Managua carrying with him bike tools, a welder and a question for his undergraduate thesis project. Alongside a group of war-disabled men, he set out in pursuit of a simple, cargo-carrying bicycle solution. What began in 1995 became two pioneering organizations – Worldbike, and it’s altruistic “for-profit” sibling, Xtracycle. In the process, Ross discovered how to enable a beautiful machine (the bicycle) to meet more needs and desires than ever before. ID Magazine declared him one of the 40 most notable socially responsible designers in the world in 2000. 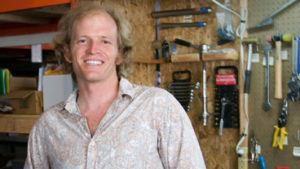 Curious and catalytic, he’s led a team of world-class eye surgeons to develop cataract surgical tools for Nepal, developed an award-winning construction toy and presented at the TED Conference. He is a Stanford-trained engineer, adventurer, inventor, humanitarian, yogi and design catalyst. Ross inspires others to do what we love to make a positive difference. He calls it “holishift”. Since 2003 Conway has worked on the founding teams of companies related to Peter Thiel (Facebook, PayPal). 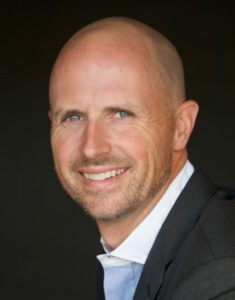 Conway transitioned his early background in finance to representing international, rock star finance executives and later helped start Xoom.com–an online financial services company now funded by Sequoia, NEA and Stanford. Conway loves ambitious people but lives a much simpler life now, enjoying his new daughter with his wife Wendy on their small farm in Carmel. He still flies up to Palo Alto regularly in his small plane to help a very talented company of Thiel’s master the organization and analysis of the World’s information. But usually you’ll find him taking calls while working in his vegetable garden or cleaning the chicken coop. Conway holds a BA from Dartmouth. Raised in New England, attended Pratt Institute, majoring in Sculpture. In 1983, Calfee embarked on a formative journey through Europe, continuing via sailboats to East Africa. He made his way on trucks across the continent to West Africa. There he obtained passage on a freighter to Brazil and eventually returned to the US. Calfee started building carbon fiber bicycles in 1987. He was one of the first to build a bicycle frame with the new material. In 1991, three-time Tour de France winner Greg LeMond ordered 18 bikes for his team and went on to license Calfee’s patented carbon fiber technology. Calfee has since continued building high-tech carbon fiber bicycle frames under his own brand name. He invented the modern bamboo bicycle in 1995 as a publicity stunt for a trade show. In 2007, Calfee started Bamboosero, a development project that brought bamboo bike production to Africa. 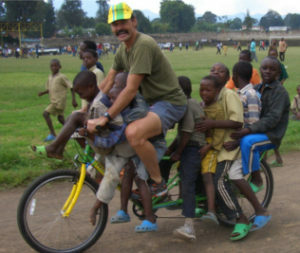 He is now directing the Congo Transport to Market Bicycle Project, a Worldbike sponsored effort. Brought up in Palo Alto, son of a pre- Silicon Valley tech engineer. Tom was a former national level road racer, and one of mountain biking’s earliest pioneers…..turned passionate international cyclist and bicycling evangelist. 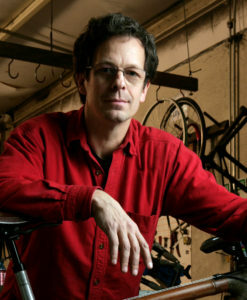 At age 15, Tom began building his own frames and soon after components, now at age 55 he continues to innovate as the head of product development for Ritchey Design, the company he started 40 years ago. After visiting Rwanda with his Mt bike in 2005, Inspired by stories of hope and the freedom that people experience from having a bike of their own, Tom founded Project Rwanda ,started Team Rwanda, Rwanda’s national cycling team, and soon thereafter was inspired to design and create a unique cargo bike for the developing Rwandan coffee farmers and establishing 3500 in country.